If I talk to one of my buddies on the phone and he says he’s recovering from the weekend, I know it’s because he got hammered. But when Carey Hart says it, it could be due to a life threatening injury. 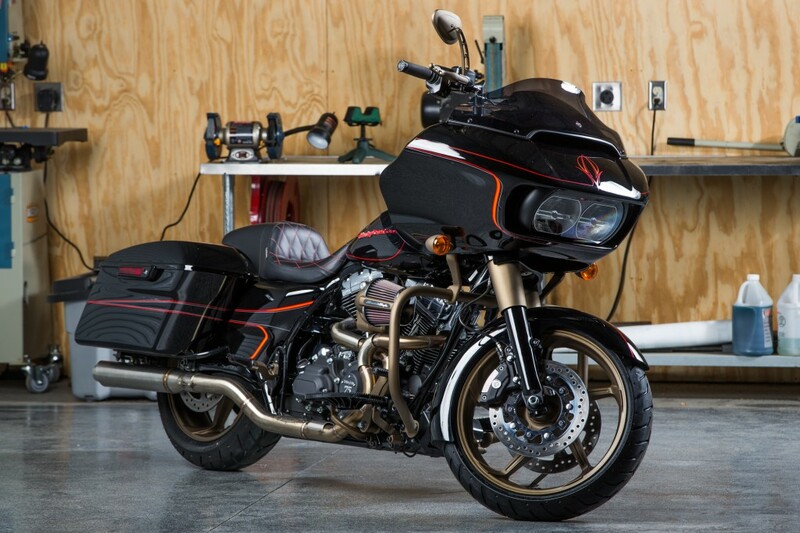 Hart is rebuilding a H-D 2015 Road Glide Custom using 90 percent Harley-Davidson P&A. The build is in preparation for a ride from Nashville, TN to the 75th Annual Sturgis Motorcycle Rally (Aug. 3-9), where he’ll showcase his creation as the 2015 Grand Marshall of the Sturgis Mayor’s Ride. How did you get hooked up with Harley Davidson? I got my first Harley when I was in my early 20s, and its always been a passion project of mine. Not only do I like riding them, but I like working on them. And just the whole culture of it. I’ve been to most of the rallys – Laughlin, Daytona, Sturgis – it’s just something I’m really into. I’m kind of in the twilight of my riding career, and I’ve come to the point in my life where I want to do more on the two-wheel bagger side. Harley sent me this bike and I did my version of a build on it. And I’m pretty happy with how it came out. At what point in your career did you accept getting hurt as part of your job and not having any fear of it? As an amateur. By the time you make it to the pro level in motocross or where you’re at the level where you are doing contests, you’ve already had a good share of injuries. Very, very few riders make it to the pro level without a few major injuries along the way. It’s part of the job – it’s not about if, it’s when. In 2003 at Tony Hawk’s Boom Boom Huck Jam, you broke both of your arms and legs in a crash. What was your first thought when you were conscious enough to realize what was happening? Just the pain. I shattered one heel, broke a femur, broke both arms… just the intense pain. I’ve broken a lot of stuff. I’m in the high 70s for broken bones. You name it, I’ve broken it. When you’re lying there in the ICU with a bone sticking out, you think, “Why the hell am I still doing this?” But as the time passes and the bones heel, everything gets back to normal, and it’s just something you do because you’ve been doing it your whole life. It’s not about a paycheck, it’s about fulfillment and wanting to keep pushing yourself. You were the first rider to ever attempt and land a backflip on a motorcycle in freestyle motocross competition. How did you get the balls to try it the first time? Looking back to the 90s, there were a lot of events, like the X Games, that were happening. And it started to get to a point where people were saying, “Oh, you’ve flattened off, you’ve done all you can do on a motorcycle, kicking your hands and feet off, all that stuff.” At the time, I had just moved back to my hometown of Las Vegas after living in Southern California for a few years and I was living with one of my best friends, T.J. Lavin, who was a pro BMX dirt jumper. We were riding BMX in his backyard one day and he asked me, “Do you think you can flip a motorcycle?” And I told him, “I think I can, but there is only one way to find out.” This was before the first motorcycle foam pit; I know because I built the first one in 2002. So in 1999, we didn’t have anywhere to try anything like that, so me and T.J. went to Camp Woodward in Pennsylvania, an action sports camp, and we spent a week out there. It was me and him, and a couple of other local pros, and I must’ve done 1,000 flips on a bicycle, really just getting comfortable being upside down, comfortable getting the rotation, and really understanding a flip. That was leading up to Gravity Games, at the time, now it’s the Dew Tour, and it kind of led up to a big event. My dad built a freestyle course previously, so I had him build a landing based on what I thought I would need, because once again, I’d never tried it. The day of the contest I showed up, threw my helmet on and went for it. I have a four-year old daughter and I could tell her 15 times, “Don’t put your hand in the fire, your hand is gonna get burned.” But you’ve got to learn for yourself once in a while. There’s been many times in a few business ventures I tackled where I had people I trust around me and that just doesn’t matter, stuff still happens, and it’s like “whoops, just put my hand in the fire myself!” There’s a learning process and it made me a better businessperson for it. You’re a high-profile person in a relationship with another high-profile person – how do you manage the demands of that, with all these other interests pulling on you? It’s just being a good partner – no ego. I like to think that I’m pretty easy going, not an ego guy, not self-centered and especially in a relationship as complicated as ours is. When she’s on tour, she’s number one. When I’m in a contest, I’m number one. It’s about being a supportive partner for the other person and you just kind of roll with the punches. For more info on the Sturgis Motorcycle Rally visit www.h-d.com/sturgis.